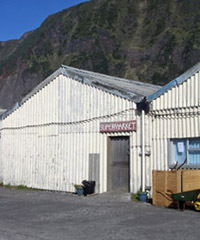 Tristan's local shopping needs are provided by the Supermarket, and the Post Office and Tourism Centre. The modern Post Office and Tourism Centre opened in 2009 and provides under one roof the Tristan Post Office, Museum, Coffee Shop, Souvenir and Handicrafts Shop. 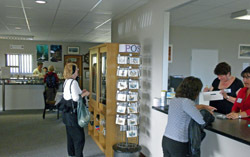 The centre provides a starting point for guided tours and a base for cruise ship passengers. 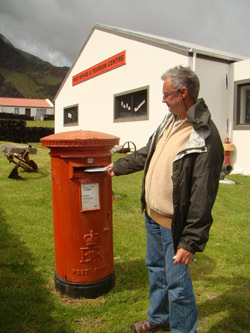 www.tristandc.com provides a full guide to purchasing stamps, souvenirs and handicrafts, with an efficient mail order service - but of course the centre welcomes personal shoppers too! 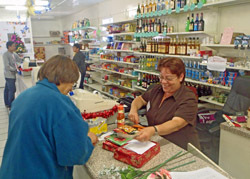 Tristan's Island Store or Supermarket doesn't have plate glass windows, or carry advertising, but it does provide essential products to supplement locally produced food and wollens. Goods need to be ordered months in advance of the arrival of incoming ships. 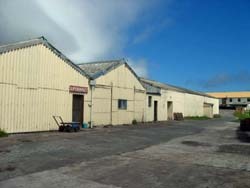 The Island Store is normally open from Monday to Friday.